"Tomoe...please forgive me my love!" The above info came from Joe M, and was edited by yours truly (contact me). The image came from kiyosato001. Akira Kiyosato is to be married to his fiance Tomoe. The wedding is cut short when Kiyosato leaves to Kyoto to serve as a bodyguard for the Shogunate member Shigekura Jurobei. He does this to prove his love to Tomoe. 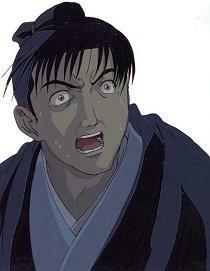 However, Kenshin is sent to eliminate the Shogunate member and his bodyguards. 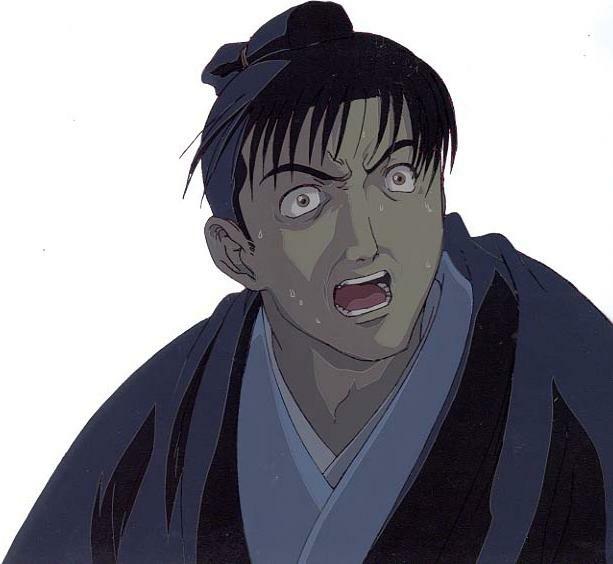 With already one of the bodyguards and Shigekura dead, Kiyosato manages to give Kenshin a vertical slash on his cheek, but soon after that he dies. Tomoe, as she lays dying, finalizes the scar by giving Kenshin a horizontal slash resulting in a X shaped scar.